Discovered by William Herschel on February 22, 1787. This is a bright lenticular galaxy, i.e. a disk galaxy without significant spiral structure. NGC 3115 is seen almost exactly edge-on. As may be guessed from its appearance, it was occasionally mis-classified as elliptical. It was discovered by William Herschel in the 1780s. 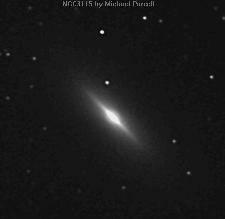 Our image was obtained by Michael Purcell on April 14, 1996 from central New Mexico with ST-7 CCD camera. One supernova has been discovered in NGC 3115 so far, supernova 1935B by Samaha. It occurred in April 1935, about 36"W and 60"N the nucleus of NGC 3115 (contrary to Burnham's statement that none of them had occurred to the time of his writing in mid-1970s). In the SAC 110 best NGC object list. Caldwell 53 in Patrick Moore's List. In the RASC's Finest N.G.C. Objects Objects list.